Here at the Customer Service Blog we usually deal with the question of how to get your customers to be more loyal. But sometimes a business will face the opposite problem. How do you deal with the situation where demand for your product unexpectedly exceeds supply? How do you satisfy the spike in demand, without upsetting your existing loyal customer base? This is an issue I had to face a few years ago when I was the Marketing Director of a health food company. One of our niche products suddenly came to public attention after being endorsed by a well-known celebrity. Within days, the whole national media had jumped onto the bandwagon, and we were securing full-page articles in almost every national newspaper, and interviews on national radio and TV. The upshot was a trebling in demand for the product within two weeks. Up until that point, whenever a health food shop or mail order customer called us, we could fulfil their order with 24 hours. But all of a sudden we were faced with a shortage of supply, a massive number of new customers, and also a smaller group of existing loyal customers who were miffed that they could no longer receive instant next-day delivery of the product. This leads me (bizarrely) onto the subject of football. In particular, the football team I have loyally supported myself for over 40 years: Lincoln City FC. Lincoln City (who are nicknamed the Imps) are currently a non-league team, playing in the fifth tier of English football. The last five years have been cruel to the Imps. The Club lost its Football League status in 2011 and since then, they have struggled both on the field of play, and also financially. Things got so bad a few years ago, that the Club’s bank (The Co-operative Bank) refused to keep them as a customer, and the Club was forced to make an agreement to pay off its debts to the Bank before looking for a new bank to do business with. But all this changed 9 months ago. The Club took on a new management team who have been extremely successful. The Imps currently sit right at the top of their division, and have a very good chance of being promoted back into the Football League this season. Average attendances have doubled, and money is flowing back into the Club. But there is a problem. 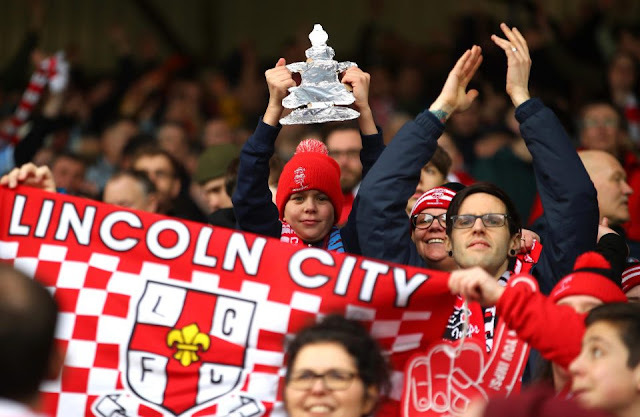 In the FA Cup, the Imps have been drawn to play against several large Championship and Premiership Teams, and the demand for tickets for these games has far outstripped supply. Most recently, the Imps made footballing history by becoming the first non-league team in over 100 years to reach the Quarter Finals of the FA Cup. They were drawn to play away against Arsenal, one of the biggest clubs in England. Lincoln City were given 9,000 tickets for their supporters (in a stadium with a capacity of 60,000). You would think that this would be more than enough tickets to satisfy demand, considering that last season some of the Imps’ home games were drawing attendances as low as 2,000. But you’d be wrong. The Imps have become a victim of their own success. Even 9,000 tickets was not enough to satisfy demand, and inevitably, a lot of fans were left disappointed. The Club attempted to prioritise their most loyal customers by allocating tickets first to season ticket holders and people who had purchased other advanced ticket packages. But this didn’t take account of other loyal supporters who, for whatever reason, were unable to get onto the priority list. I am myself a case in point. I live a 160 mile round-journey from Lincoln, so I am unable to attend every single game. So buying a season ticket didn’t make sense for me personally. But I do go to most games, and I have done so for around 40 years. Considering that in most of those four decades I have lived a long way from Lincoln, I think I can be counted as one of the Club’s most loyal fans! Fortunately, I have a very good friend living in Lincoln who got a ticket for me, so I was able to enjoy the historic occasion of seeing my beloved Lincoln City play against Arsenal. But social media is now awash with hundreds of angry fans who are complaining bitterly that they weren’t able to get tickets for the Arsenal match. And many of them are complaining (with some justification) that many people who are ‘new’ supporters, managed to obtain tickets for the Arsenal game, even though numerous loyal fans couldn’t get tickets for the game. In any business context, it is a nightmare scenario if you upset your long-standing loyal customers by denying them a product or service, while allowing new customers to have access to the same product or service. It's worth taking a look at my blog article dated 08.07.16 discussing the research work of Reinartz and Kumar at Harvard University, where customers were divided into four distinct categories: 'True Friends', 'Butterflies', 'Strangers', and 'Barnacles'. But what could Lincoln City have done differently? And what can the football club learn for the future? This is a question I will answer in Part 2 of this blog article. Darren Bugg is a marketing and customer service expert with 30 years’ experience working in this field. He holds a Masters Degree in Marketing and Innovation, in which he specialised in the subject of customer loyalty. His new book ‘The Loyalty Gap - the 7 Secrets of Customer Loyalty’ will be published later this year.